Brantford – A new exhibit examining the feeling of place will run at Wilfrid Laurier University’s Yellow Brick Wall gallery at the university’s Brantford campus Oct. 29 to Dec. 14, 2018. The Things I See showcases the abstract landscapes and still life works of artist Linda Verhey Sinke. Verhey Sinke, a resident of Paris, Ont., uses her observational experiences to inspire her acrylic on canvas pieces. 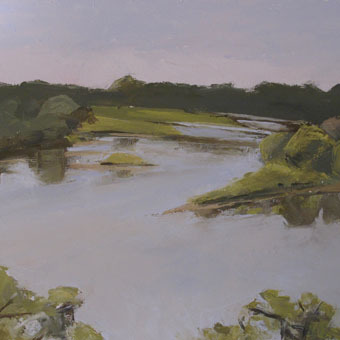 Verhey Sinke’s time spent as a student studying life around her is reflected in her paintings. Verhey Sinke studied at the Dundas Valley School of Art and the International School of Drawing, Painting and Sculpture in Umbria, Italy. Her work has been featured in a number of exhibits, with the most recent showing during the Brant Studio Tour and Brant Colours Plein Air Event. The Yellow Brick Wall is the exhibition venue at the Brantford campus of Wilfrid Laurier University, located at 97 Dalhousie St. The venue is designed to provide appreciation and enjoyment of Canadian art to members of the Laurier community and beyond. The Yellow Brick Wall aims to contribute to the growth of Laurier students, encourage dialogue and reflect the diversity and culture in the Brantford community.